Demetrious Khrisna Johnson (born August 13, 1986) is an American mixed martial artist and former freestyle wrestler. He is currently signed to ONE Championship, in which he competes in the men's flyweight division. He is the inaugural and former UFC Flyweight Champion and currently holds the UFC record for most consecutive title defenses with 11. Known for his quick striking and elusive movement, Johnson has also landed the most takedowns in UFC flyweight history and co-holds the record for the latest finish in UFC history with a submission win at 4:59 of the fifth round against Kyoji Horiguchi. He is also the only UFC fighter to record over 10 takedowns in three different fights. Demetrious Johnson holds the record for most finishes in UFC flyweight history with 7. ESPN, MMA Weekly, and various UFC personnel have called Johnson one of the greatest mixed martial artists in the world. Sherdog ranks Johnson as the #9 pound-for-pound fighter in mixed martial arts and as the #2 flyweight. He is widely regarded to be one of the greatest mixed martial artists of all time. He holds notable victories over Henry Cejudo, Joseph Benavidez x2, John Dodson x2, Kyoji Horiguchi, Miguel Torres, and Norifumi Yamamoto. Born in Kentucky, Johnson grew up in Parkland, Washington where he attended Washington High School and was a stand-out athlete in track, wrestling, and cross country. In wrestling, he placed 3rd and 2nd in state in his junior and senior years. Although he participated in track and cross country to improve his cardio for wrestling, he competed at the State Championships in both sports as well. Johnson began his career in mixed martial arts (MMA) in 2007 and won his professional debut via first-round knockout. Johnson then appeared on multiple local shows and won his next 8 fights, including five in a row by submission. Johnson fought at the Alaska Fighting Championships in Anchorage and won via head kick KO, which earned him a deal with the WEC. He made his World Extreme Cagefighting debut at bantamweight against Brad Pickett on April 24, 2010, at WEC 48 in Sacramento, California. Johnson showed good kickboxing throughout, but was unable to defend the many takedowns executed by Pickett. Johnson lost via unanimous decision. Joe Rogan predicted during the fight that, should the WEC implement a flyweight division, Johnson would be highly effective, as he was a relatively small bantamweight. Johnson was expected to face Clint Godfrey on September 30, 2010, at WEC 51. However, Godfrey was forced off the card and replaced by WEC newcomer Nick Pace. Johnson defeated Pace via unanimous decision, handing Pace his first ever MMA loss. Johnson defeated Damacio Page via third round submission on November 11, 2010, at WEC 52. After Page controlled the action in the first round, Johnson was able to dictate the action for most of the second and third rounds before submitting the visibly tired Page via guillotine choke. Johnson later said, "He was basically drowning, and I was the shark that came up and got him from underneath." On October 28, 2010, World Extreme Cagefighting merged with the Ultimate Fighting Championship. As part of the merger, all WEC fighters were transferred to the UFC. Johnson faced Japanese superstar Norifumi Yamamoto on February 5, 2011, at UFC 126 in his UFC debut, Johnson utilized take downs in round 1 and 2, controlling Yamamoto throughout the fight, and being rewarded with a unanimous decision victory. Johnson was scheduled to face Renan Barão on May 28, 2011, at UFC 130. However, Johnson faced Miguel Torres after Torres' opponent, Brad Pickett was forced off the card with an injury. Despite breaking his fibula early in the second round from a checked leg kick, Johnson used his superior wrestling to control Torres and won a 29-28 unanimous decision victory, even though he was swept into full mount a record breaking 6 times during the fight. Johnson fought Dominick Cruz on October 1, 2011, at UFC Live: Cruz vs. Johnson for the UFC bantamweight title, losing by unanimous decision. Johnson was briefly linked to a bout with Eddie Wineland on January 28, 2012, at the UFC's second event on Fox. However, Johnson was pulled from the bout to take part in a four-man flyweight tournament to determine the UFC's first UFC Flyweight Champion. Johnson faced Ian McCall on March 3, 2012, in the first round of the Flyweight Tournament at UFC on FX 2. This fight was the first flyweight bout in UFC history. The fight with McCall went all three rounds, was turned over to the judges' score cards and announced as a majority decision win for Johnson. Later, in the post fight press conference, UFC president Dana White announced that the athletic commission made a mistake when scoring the match and that officially the bout was ultimately scored a majority draw (28–28, 29–29, and 29–28 Johnson). A rematch with McCall took place on June 8, 2012, at UFC on FX: Johnson vs. McCall. Johnson won the fight via unanimous decision to progress to the final round of the tournament. Johnson faced Joseph Benavidez in the finals of the UFC Flyweight Tournament on September 22, 2012, at UFC 152. Johnson defeated Benavidez in a close and fast-paced fight via split decision (48–47, 47–48, and 49–46) to become the inaugural UFC Flyweight Champion. Johnson fought John Dodson on January 26, 2013, at UFC on Fox: Johnson vs. Dodson. Dodson managed to match Johnson's speed and also dropped him twice with left hands, but as the fight went on the champion took control and almost finished Dodson in the last seconds of the fifth round. Johnson eventually won the fight via unanimous decision (48–47, 49–46, and 48–47) in a bout that earned both participants Fight of the Night honors. Johnson was expected to face John Moraga on April 13, 2013, at The Ultimate Fighter 17 Finale. However, Johnson was forced out of the bout with an injury and Moraga was pulled from the event as well. The bout with Moraga eventually took place on July 27, 2013, at UFC on Fox: Johnson vs. Moraga, where Johnson was looking to defend his title for a second time. Johnson dominated the fight for nearly all five rounds and despite being ahead on the scorecards, he continued to work for the finish and eventually won via an armbar submission late in the fifth round. The win also earned Johnson his first Submission of the Night bonus award. A rematch with Joseph Benavidez was expected for November 30, 2013, at The Ultimate Fighter 18 Finale. However, the bout was shifted to December 14, 2013, at UFC on Fox 9 after that event's headliner was postponed due to injury. Johnson won the rematch in emphatic fashion via knockout in the first round, becoming the first and only person to stop Benavidez. The win also earned Johnson his first Knockout of the Night bonus award. Johnson faced Ali Bagautinov on June 14, 2014, at UFC 174. He successfully defended his title for a fourth time, winning by unanimous decision. Subsequent to his win, on July 10, the British Columbia Athletic Commission (BCAC) announced that Bagautinov tested positive for erythropoietin (EPO) prior to the title fight. In response, the BCAC suspended Bagautinov from mixed martial arts competition for one year. A bout with Chris Cariaso was expected on August 30, 2014, at UFC 177. However, the bout was shifted to September 27, 2014, at UFC 178 after that event's headliner was cancelled due to injury. Johnson won the fight via submission due to a kimura in the second round. This marked Johnson's fifth title defense and the first time that a kimura was used to end a fight in a UFC championship title bout. Johnson faced Kyoji Horiguchi at UFC 186, winning the one-sided fight via an armbar submission at 4:59 of the fifth round, resulting in the latest finish in UFC history. This win also secured Johnson a Performance of the Night bonus award. A rematch with John Dodson took place on September 5, 2015, at UFC 191. In a largely one-sided affair, Johnson won the fight via unanimous decision. Johnson faced Olympic Gold Medalist Henry Cejudo on April 23, 2016, at UFC 197. He won the fight via TKO in the first round after dropping Cejudo with a variety of strikes. The win earned Johnson his second Performance of the Night bonus. Johnson next faced Tim Elliott on December 3, 2016, at The Ultimate Fighter 24 Finale. Despite being a heavy favorite, Johnson was taken down for the first time in Flyweight and nearly submitted with a d'arce choke in the first round. He went on to win the remaining rounds, and defended the Championship via a decisive unanimous decision. Johnson faced Wilson Reis on April 15, 2017, at UFC on Fox 24. He won by armbar submission in the third round and subsequently received a Performance of the Night bonus. With the win, Johnson tied Anderson Silva for most consecutive title defenses (ten) in UFC history. In July 2017, Johnson won an ESPY Award for Fighter of The Year. Johnson was briefly linked to an August 2017 fight with T.J. Dillashaw. He was scheduled to face Ray Borg on September 9, 2017, at UFC 215. In turn, the fight was canceled a day before the event, as Borg was forced to withdraw from the fight on Thursday evening due to illness. According to multiple sources, Borg has been battling an illness this week and was deemed unfit to fight by UFC doctors. The bout was quickly rescheduled and took place at UFC 216. Johnson won the fight via suplex-to-armbar in the fifth round. This win earned him the Performance of the Night award and set the 11th successful title defense record, surpassing former middleweight champion Anderson Silva's record of 10 in the UFC. Johnson's win was called the best submission of the year from publications such as Sherdog, MMA Mania.com, and The MAC Life. Johnson faced Cejudo in a rematch at UFC 227 on August 4, 2018 for the UFC Flyweight Championship title. After a record 11 consecutive successful title defenses, Johnson's championship reign came to an end via a split decision loss to Cejudo. This fight earned him the Fight of the Night award. 13 of 25 media outlets scored the bout in favor of Cejudo, while 12 scored it for Johnson. On October 27, 2018, Johnson was traded to ONE Championship for former ONE Welterweight Champion Ben Askren. Johnson was expected to make his promotional debut in the first quarter of 2019. On November 7, 2018, it was announced that Johnson would be one of eight participants in the ONE Flyweight Grand Prix. On December 19, 2018, it was announced that Johnson will be facing Yuya Wakamatsu at ONE Championship: A New Era on March 31, 2019, in the promotion's inaugural event in Japan. In his ONE Championship debut, Demetrious Johnson defeated Yuya Wakamatsu via submission (guillotine choke) in the second round. UFC commentator Joe Rogan, UFC president Dana White, ESPN.com, and other media outlets have called Johnson the greatest mixed martial artist in the world. Known as one of the fastest fighters in MMA. Johnson's martial arts background is in Freestyle wrestling which he uses effectively to control where the fight takes place, landing numerous takedowns in a single match when necessary. In addition to his wrestling base, Johnson is also recognized for quick striking and elusive movement. He is noted for his ability to land fast punches and kicks to the head or body, then quickly escape an opponent's reach. He is also known for his ability to counterstrike while standing within the pocket. During upperbody clinches, Johnson has also utilized the Muay Thai plum while mixing in a series of elbows and knees. To complement his Freestyle wrestling base Johnson is also schooled in Catch wrestling under his long-term coach Matt Hume, as evident by his Catch style direct suplex-to-armlock transition against Ray Borg, and his Double wrist lock submission (aka Kimura) of Chris Cariaso. Johnson had a harsh childhood; he was raised by his deaf mother and an abusive stepfather. Johnson has never met his biological father, "I've never seen a picture of him, not a glimpse, nothing." The main thing that has helped him move on from his past is his wife, Destiny Johnson. He says "she is the best thing that has ever happened to me and without her, life would be incomplete." They were wed May 11, 2012, in Hawaii. They have two sons: Tyron born in 2013, and Maverick born April 15, 2015, and a daughter who was born in August 2018. Johnson is an avid gamer and streams his gaming via Twitch.tv with username mightygaming. Win 28–3–1 Yuya Wakamatsu Submission (guillotine choke) ONE Championship: A New Era March 31, 2019 2 2:40 Tokyo, Japan Return to Flyweight (135 lbs). ONE Championship Flyweight Grand-Prix Quarterfinal. Loss 27–3–1 Henry Cejudo Decision (split) UFC 227 August 4, 2018 5 5:00 Los Angeles, California, United States Lost the UFC Flyweight Championship. Fight of the Night. Win 27–2–1 Ray Borg Submission (armbar) UFC 216 October 7, 2017 5 3:15 Las Vegas, Nevada, United States Defended the UFC Flyweight Championship. Broke the UFC record for most consecutive title defenses (11). Performance of the Night. Win 26–2–1 Wilson Reis Submission (armbar) UFC on Fox: Johnson vs. Reis April 15, 2017 3 4:49 Kansas City, Missouri, United States Defended the UFC Flyweight Championship. Performance of the Night. Win 25–2–1 Tim Elliott Decision (unanimous) The Ultimate Fighter: Tournament of Champions Finale December 3, 2016 5 5:00 Las Vegas, Nevada, United States Defended the UFC Flyweight Championship. Win 24–2–1 Henry Cejudo TKO (knees and punches) UFC 197 April 23, 2016 1 2:49 Las Vegas, Nevada, United States Defended the UFC Flyweight Championship. Performance of the Night. Win 23–2–1 John Dodson Decision (unanimous) UFC 191 September 5, 2015 5 5:00 Las Vegas, Nevada, United States Defended the UFC Flyweight Championship. Win 22–2–1 Kyoji Horiguchi Submission (armbar) UFC 186 April 25, 2015 5 4:59 Montreal, Quebec, Canada Defended the UFC Flyweight Championship. Performance of the Night. Latest finish in UFC history. Win 21–2–1 Chris Cariaso Submission (kimura) UFC 178 September 27, 2014 2 2:29 Las Vegas, Nevada, United States Defended the UFC Flyweight Championship. Win 20–2–1 Ali Bagautinov Decision (unanimous) UFC 174 June 14, 2014 5 5:00 Vancouver, British Columbia, Canada Defended the UFC Flyweight Championship. Win 19–2–1 Joseph Benavidez KO (punch) UFC on Fox: Johnson vs. Benavidez 2 December 14, 2013 1 2:08 Sacramento, California, United States Defended the UFC Flyweight Championship. Knockout of the Night. Win 18–2–1 John Moraga Submission (armbar) UFC on Fox: Johnson vs. Moraga July 27, 2013 5 3:43 Seattle, Washington, United States Defended the UFC Flyweight Championship. Submission of the Night. Win 17–2–1 John Dodson Decision (unanimous) UFC on Fox: Johnson vs. Dodson January 26, 2013 5 5:00 Chicago, Illinois, United States Defended the UFC Flyweight Championship. Fight of the Night. Win 15–2–1 Ian McCall Decision (unanimous) UFC on FX: Johnson vs. McCall June 8, 2012 3 5:00 Sunrise, Florida, United States UFC Flyweight Tournament Semifinal. Draw 14–2–1 Ian McCall Draw (majority) UFC on FX: Alves vs. Kampmann March 3, 2012 3 5:00 Sydney, Australia Flyweight debut. UFC Flyweight Tournament Semifinal. Fight of the Night. Loss 14–2 Dominick Cruz Decision (unanimous) UFC Live: Cruz vs. Johnson October 1, 2011 5 5:00 Washington D.C., United States For the UFC Bantamweight Championship. ^ "Fight Card - UFC 191 Johnson vs. Dodson 2". UFC.com. Retrieved September 6, 2015. ^ "Former UFC Champion Demetrious "Mighty Mouse" Johnson Earns Brown Belt". Jiu-Jitsu Times. October 17, 2018. Retrieved October 21, 2018. ^ "UFC 216 results: Demetrious Johnson sets title defense record with brutal submission". CBSSports.com. Retrieved October 8, 2017. ^ UFC - Ultimate Fighting Championship (August 25, 2015). "UFC 191: Johnson vs Dodson 2 - Extended Preview" – via YouTube. ^ Okamoto, Brett (September 7, 2015). "Demetrious Johnson shines at UFC 191". ESPN. Retrieved September 8, 2015. ^ a b "Why Demetrious Johnson is the Pound-for-Pound King". MMAWeekly.com. September 4, 2015. Retrieved September 8, 2015. ^ Bohn, Mike (September 6, 2015). 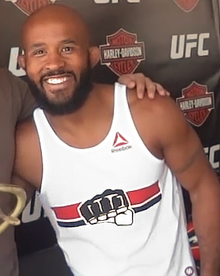 "Dana White agrees with Rogan: Demetrious Johnson is 'pound-for-pound greatest'". MMAjunkie.com. Retrieved September 8, 2015. ^ "Sherdog.com's Pound-for-Pound Top 10". sherdog.com. ^ "Sherdog Official Mixed Martial Arts Rankings". Sherdog.com. ^ Robert Rousseau. "Biography and Profile of Demetrious Johnson". martialarts.about.com. ^ a b Mike Renouard (April 14, 2010). "WEC Pre-fight Interview with Demetrious Johnson". nwfightscene.com. ^ "Brad Pickett vs. newcomer Demetrious Johnson official for WEC 48 prelims". MMAJunkie.com. Retrieved April 27, 2016. ^ "Clint Godfrey vs. Demetrious Johnson set for WEC 51 preliminary card". mmajunkie.com. August 3, 2010. Archived from the original on August 6, 2010. ^ "Nick Pace replaces Clint Godfrey, faces Demetrious Johnson at WEC 51". mmajunkie.com. September 8, 2010. Archived from the original on September 12, 2010. Retrieved September 12, 2010. ^ Staff (October 26, 2010). "Demetrious Johnson vs. Damacio Page official for WEC 52, card set with 11 bouts". mmajunkie.com. Retrieved October 26, 2010. ^ "Sherdog's Top 10: Giant Killers". Sherdog. Retrieved July 12, 2015. ^ "UFC and WEC set to merge in 2011; events to air on Versus and Spike TV". mmajunkie.com. October 28, 2010. Archived from the original on October 31, 2010. ^ "Norifumi "Kid" Yamamoto Signs With UFC; Debuts Against Demetrious Johnson In February". mmaweekly.com. December 10, 2010. ^ ""Mighty Mouse" vs. Barao added to UFC 130". mmajunkie.com. March 12, 2011. Archived from the original on July 10, 2012. Retrieved March 13, 2011. ^ "UFC 130: Miguel Torres vs Demetrious Johnson booked with Brad Pickett injured". mmamania.com. April 21, 2011. ^ Michael David Smith (May 28, 2011). "UFC 130: Demetrious Johnson Beats Miguel Torres". mmafighting.com. Retrieved May 28, 2011. ^ "Champ Dominick Cruz defends title against Demetrious Johnson at UFC on Versus 6". mmajunkie.com. July 22, 2011. Archived from the original on July 24, 2011. ^ Damon Martin (November 21, 2011). "Demetrious Johnson vs. Eddie Wineland In the Works for UFC on Fox 2". mmaweekly.com. Retrieved November 21, 2011. ^ "UFC adds flyweights: Johnson vs. McCall, Benavidez vs. Urushitani at UFC on FX 2". mmajunkie.com. December 11, 2011. Archived from the original on January 7, 2012. ^ "UFC on FX 2 Main Card Results". UFC.com. March 3, 2012. ^ "Breaking news: Demetrious Johnson vs Ian McCall result overturned, majority draw requires rematch". mmamania.com. March 3, 2012. ^ Dave Doyle (June 8, 2012). "UFC on FX 3 Results: Demetrious Johnson Tops Ian McCall, Earns Flyweight Title Shot". mmafighting.com. Retrieved June 8, 2012. ^ Staff (September 23, 2012). "UFC 152 results: Demetrious Johnson edges Joseph Benavidez, claims flyweight title". mmajunkie.com. Retrieved September 23, 2012. ^ "Demetrious Johnson vs. John Dodson to headline UFC on FOX 6". bloodyelbow.com. November 6, 2012. Retrieved November 6, 2012. .
^ Sherdog.com. "Demetrious Johnson Outduels John Dodson, Keeps Flyweight Title at UFC on Fox 6". Sherdog. Retrieved August 12, 2018. ^ Brian Knapp (January 26, 2013). "Demetrious Johnson outduels John Dodson, keeps flyweight title at UFC on Fox 6". sherdog.com. Retrieved January 26, 2013. ^ Mike Whitman (January 26, 2013). "UFC on Fox 6 Bonuses: Demetrious Johnson, John Dodson, Anthony Pettis, Ryan Bader Net $50,000". sherdog.com. Retrieved January 26, 2013. ^ Staff (February 26, 2013). "Demetrious Johnson injured, title fight with John Moraga off TUF 17 Finale". MMA Junkie. Retrieved February 26, 2013. ^ "Demetrious Johnson overpowers John Moraga, defends title". USA TODAY. Retrieved August 12, 2018. ^ Staff (July 27, 2013). "UFC on FOX 8 bonuses: Johnson, Guillard, Herman, Smith earn $50,000". mmajunkie.com. Retrieved July 27, 2013. ^ Staff (September 18, 2013). "Joseph Benavidez meets UFC flyweight champ Demetrious Johnson at TUF 18 Finale". mmajunkie.com. Retrieved September 18, 2013. ^ Staff (November 10, 2013). "Pettis-Thomson off UFC on FOX 9, Johnson-Benavidez shifts to main event". mmajunkie.com. Retrieved November 10, 2013. ^ Matt Erickson. "UFC on FOX 9 bonuses: Johnson, Faber, Barboza, Castillo win $50,000". MMAjunkie. Retrieved December 14, 2013. ^ Steven Marrocco (June 15, 2015). "UFC 174 results, photos: Demetrious Johnson defends again, tops Ali Bagautinov". mmajunkie.com. Retrieved June 15, 2014. ^ Staff. "BCAC: Ali Bagautinov tests positive for EPO for UFC 174, suspended one year". MMAjunkie.com. Retrieved July 10, 2014. ^ Staff (August 12, 2014). "Johnson vs. Cariaso new main event of UFC 178". newsroom.mgmgrand.com. Retrieved August 12, 2014. ^ Damon Martin (September 28, 2014). "Demetrious Johnson dominates, submits Chris Cariaso in UFC 178 main event". foxsports.com. Retrieved September 28, 2014. ^ Alex Schlinsky (April 26, 2015). "UFC 186 results: Demetrious Johnson dominates, submits Kyoji Horiguchi in last second of title fight". mmamania.com. Retrieved April 26, 2015. ^ Matt Erickson (April 26, 2015). "UFC 186 bonuses: Yeah, duh – Demetrious Johnson got $50,000 for that craziness". mmajunkie.com. Retrieved April 26, 2015. ^ Steven Marrocco (September 6, 2015). "UFC 191 results: Demetrious Johnson near perfect in second title win over John Dodson". mmajunkie.com. Retrieved September 6, 2015. ^ Tristen Critchfield (February 6, 2016). "Demetrious Johnson to Defend Flyweight Crown vs. Henry Cejudo at UFC 197". sherdog.com. Retrieved February 6, 2016. ^ Dave Doyle (April 23, 2016). "UFC 197 results: Demetrious Johnson steamrolls Henry Cejudo". mmafighting.com. Retrieved April 23, 2016. ^ Tristen Critchfield (April 23, 2016). "UFC 197 bonuses: Johnson, Rodriguez, Roberts, Steele pocket $50K awards". sherdog.com. Retrieved April 23, 2016. ^ Matt Erickson (May 11, 2016). "'TUF 24' gets other flyweight champs with coaches Benavidez, Cejudo; winner fights champ Johnson". mmajunkie.com. Retrieved May 11, 2016. ^ Staff (November 30, 2016). "Tim Elliott wins 'TUF 24' flyweight tournament, challenges champ Demetrious Johnson at TUF 24 Finale". mmajunkie.com. Retrieved November 30, 2016. ^ Steven Marrocco (May 11, 2016). "TUF 24 Finale results: Demetrious Johnson defends flyweight belt over gritty, game Tim Elliott". mmajunkie.com. Retrieved May 11, 2016. ^ Damon Martin (April 16, 2017). "Demetrious Johnson mauls Wilson Reis to tie all-time record for UFC title defenses". foxsports.com. Retrieved April 16, 2017. ^ "UFC on FOX 24 bonuses: History maker Demetrious Johnson among the night's winners". MMAjunkie. April 16, 2017. Retrieved April 16, 2017. ^ Dave Doyle (July 13, 2017). "Demetrious Johnson wins ESPY for Fighter of the Year". mmafighting.com. Retrieved July 13, 2017. ^ Jesse Holland (May 19, 2017). "Dana White 'loves' the idea of Demetrious Johnson vs TJ Dillashaw flyweight title fight". mmamania.com. Retrieved May 19, 2017. ^ Dave Doyle (July 20, 2017). "Demetrious Johnson vs. Ray Borg set for UFC 215". mmafighting.com. Retrieved July 20, 2017. ^ Ariel Helwani (September 8, 2017). "Demetrious Johnson vs. Ray Borg UFC 215 main event canceled". mmafighting.com. Retrieved September 8, 2017. ^ Shaun Al-Shatti (September 13, 2017). "Demetrious Johnson vs. Ray Borg rebooked for UFC 216". mmafighting.com. Retrieved September 13, 2017. ^ "UFC 216 results: Insane Demetrious Johnson armbar forces Ray Borg tap in fifth round". MMAjunkie. October 8, 2017. Retrieved October 8, 2017. ^ "UFC 216 bonuses: Demetrious Johnson's late finish became his eighth UFC fight-night bonus". MMAjunkie. October 8, 2017. Retrieved October 8, 2017. ^ "Demetrious Johnson vs. Henry Cejudo 2 booked for UFC 227". MMA Fighting. Retrieved June 10, 2018. ^ Ballentine, Alex. "Henry Cejudo Defeats Demetrious Johnson by Split Decision at UFC 227". Bleacher Report. Retrieved August 12, 2018. ^ "UFC 227 bonuses: Champs Dillashaw, Cejudo among $50,000 winners in Los Angeles". MMAjunkie. August 5, 2018. Retrieved August 5, 2018. ^ "Cejudo def. Johnson". mmadecisions.com. August 5, 2018. ^ "Sources: Johnson, Askren trade set for UFC, ONE". ESPN.com. Retrieved October 27, 2018. ^ James Goyder (October 28, 2018). "It's Official! Demetrious Johnson Signs With ONE Championship". mmaweekly.com. ^ "ONE Announces Flyweight, Lightweight tourneys featuring Demetrious Johnson, Eddie Alvarez". ^ "Demetrious Johnson, Eddie Alvarez make ONE Championship debuts March 31 in Japan". mmajunkie.com. December 19, 2018. ^ Lee, Alexander K. (March 31, 2019). "ONE Championship: A New Era results: Shinya Aoki chokes out Eduard Folayang to win title, Xiong Jing Nan stops Angela Lee". MMA Fighting. Retrieved April 1, 2019. ^ "Demetrious Johnson — Seize The Day". UFC.com. Retrieved September 8, 2015. ^ Keefer, Case (June 8, 2012). "Persistence pays off for Demetrious Johnson at UFC on FX 3". Las Vegas Sun. Retrieved September 8, 2015. ^ Iole, Kevin (December 15, 2013). "Demetrious Johnson's demolition of Joseph Benavidez ignites Fighter of the Year buzz". Yahoo. Retrieved September 8, 2015. ^ Richardson, Andrew (September 3, 2015). "UFC 191 complete fighter breakdown, Demetrious 'Mighty Mouse' Johnson edition". mmamania.com. Retrieved September 8, 2015. ^ "UFC champ Demetrious Johnson coach Matt Hume on creating a perfect martial artist". mmajunkie.com. Retrieved January 12, 2018. ^ "Barnett and Cormier Talk Catch Wrestling". embodiedstrength.com. Retrieved January 12, 2018. ^ "Ken Shamrock vs Matt Hume Pancrase Road to the Championship 2". Retrieved January 12, 2018 – via YouTube. ^ Yael Grauer (September 29, 2011). "No stranger to adversity". sherdog.com. Retrieved September 29, 2013. ^ Steven Marrocco (July 24, 2013). "Demetrious Johnson only lost one day of UFC on FOX 8 training with birth of son". mmajunkie.com. Archived from the original on July 26, 2013. Retrieved July 24, 2013. ^ Sherdog.com. "Sherdog.com's 2017 Submission of the Year". Sherdog. Retrieved December 21, 2017. ^ "Full list of 2017 ESPYS winners". ESPN.com. Retrieved July 17, 2017. ^ Fox Sports. "2013 Fighter of the Year: Demetrious Johnson". FOX Sports. Retrieved July 12, 2015. ^ "MMAjunkie's 'Submission of the Month' for April is a highlight-reel record-breaker - MMAjunkie". MMAjunkie. Retrieved July 12, 2015. ^ "The 2017 'Fighter of the Year' Is ..." MMAmania.com. Retrieved December 25, 2017. ^ "The Best Submissions Of 2017 Are ..." MMAmania.com. Retrieved December 25, 2017. ^ Snowden, Jonathan. "Bleacher Report 2017 MMA Awards: Best Fighter, Fight, Finishes and Story". Bleacher Report. Retrieved January 3, 2018. ^ "ESPN's MMA awards for 2017: The fight, submission and knockout of the year". ESPN.com. Retrieved January 3, 2018. ^ "Pundit Arena's 2017 UFC Awards - Pundit Arena". www.punditarena.com. Retrieved January 3, 2018. ^ "MMA Fighting's 2017 Submission of the Year: Demetrious Johnson's legendary armbar of Ray Borg". MMA Fighting. Retrieved January 6, 2018. ^ "Bloody Elbow 2017 Year-End Awards - Results". Bloody Elbow. Retrieved January 17, 2018. ^ Sherdog.com. "Demetrious". Sherdog. Retrieved September 14, 2018.